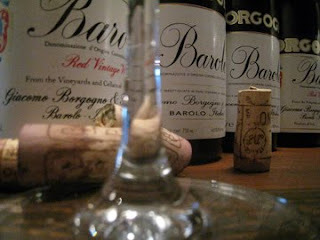 I hosted a private tasting of one of the most respected and traditional producers of Barolo, Giacomo Borgogno. We had a unique opportunity to taste this highly regarded producer, and the really special aspect of this tasting was that we were able to try older vintages. 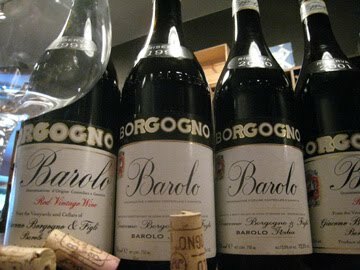 My supplier offered a rare opportunity to compile a vertical of Borgogno's Barolo Riserva from 1998, 1999, 2000 and 2001 from the winery's pristine cellar. All of the vintages showed well. There was a remarkable consistency to the wines, though they all differed as vintage conditions dictated. Tasting a vertical of a single producer is one of the great arguments for buying a producer and not a vintage. 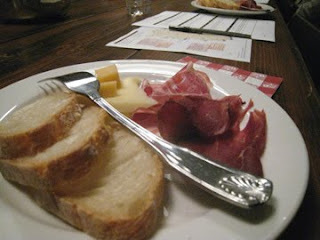 Each vintage expressed itself differently and could be applied to different food settings. The 1998 seemed the most "closed," but was expressive enough that one knew it could develop another 10-20 years flawlessly. The 1999 was fragrant and dense but also had the mark of a structured vintage. The 2000 stood out the most. It was open knit and ready to drink. And the 2001 seemed to have more of everything, including plenty of upside to cellaring. We enjoyed them all for different reasons. The Borgogno Estate - the Borgogno family is one of the dynasties of Barolo and traces its origins in the wine trade back to 1761, making it perhaps the oldest house in the entire zone. The approach, until recently, has been, understandably, ultra conservative, at times resembling virtual immobility, but things seem to be loosening up in recent years and the Riserva wines are well worth looking for. (93 Points: Wine Advocate) The 1998 Barolo Classico Riserva, in fact, is outstanding, very sizeable in its expression of the roses, resin, plums, and anisette of Nebbiolo and endowed with a powerhouse palate, very rich but round and velvety as well. The fruit, minerals, and classy tannins of the close, the sweetness and irresistible texture make this one of the essential wines of the 1998 vintage. (92 Points: Wine Advocate) Light to medium translucent ruby in color. Very fragrant nose of roses, anise, eucalyptus, and tar, this mid-weight wine shows flavors of ripe red fruits and licorice on the palate and a delicate lingering finish. Classic and austere, this is an infant today. (89+ Points: Wine Advocate) Medium ruby in color. Intense nose of spices, menthol and minerals. The medium-bodied 2000 Classico is dense on the palate, with plenty of red cherry fruit and excellent length in the house's austere style. This had been bottled only for about a month before I tasted it, and it remains shut down, but seems to offer outstanding potential. This bottle could merit a higher score after some time in bottle. (91 Points: Wine Advocate) The 2001 Barolo Classico Riserva is sweet and open on the nose, with suggestions of very ripe black cherries, violets and tar. Medium in body, it nevertheless packs plenty of power, with outstanding length and elegant tannins on the fresh, inviting finish. It is a remarkably elegant and accessible wine for this estate even if it closed down somewhat in the glass.